The film's star, Richie Andrusco, was cast because he projected "animal strength." The Brooklyn College Library will host a very special screening of the critically acclaimed 1953 film The Little Fugitive, followed by an appearance by Morris Engel, who produced the film with his wife, the noted photographer Ruth Orkin. Celebrated for its vivid portrayal of 1950s Coney Island, The Little Fugitive won the Silver Lion at the 1953 Venice Film Festival and the film's screenplay, written by Ray Ashley, received an Oscar nomination for best motion picture story. 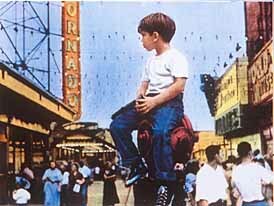 Photographed by Morris Engel using a specially designed camera that strapped to his body and permitted him to film unobtrusively, the movie tells the story of a seven- year-old boy who, mistakenly believing he has killed his brother, runs away to Coney Island. With six dollars in his pocket and a fascination with amusement rides and junk foods, Joey spends a weekend indulging in the sights and sounds of this renowned Brooklyn attraction. 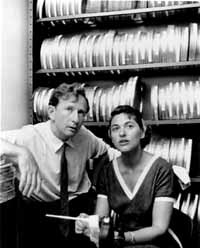 Filmmakers Morris Engel and Ruth Orkin ( courtesyBright Lights Film Journal). Engel, a 1935 graduate of Abraham Lincoln High School, grew up in Brooklyn and has a great affection for Coney Island. A photographer, Engel had previously worked for the legendary newspaper P.M. and spent four years in the U.S. Navy, serving as a combat photographer during the invasion of Normandy. When he started to make The Little Fugitive, underground or independent film did not existthe technology and expertise needed to make such a film were prohibitively expensive. "My wife grew up in Hollywood and worked as a messenger at MGM, so she knew all about how films were made," Engel remembers. "When I told her that I was going to make a film, she told me that it couldn't be done. We started work on the film and our film editor quit, so I asked Ruth if she would edit our dailies. She resisted, but pretty soon she fell in love with the material and edited it for us and did a fantastic job. In no time at all she became the ideal editor. Because she had worked in Hollywood, where her mother was a silent-screen star, she knew all about continuity and film editing, which was lucky for us because we didn't have a clue!" Orkin and Engel made two more films together, Lovers and Lollypops (1955) and Weddings and Babies (1958). Orkin passed away in 1985, but her photographic works, especially her 1951 photo American Girl in Italy, have become classics. 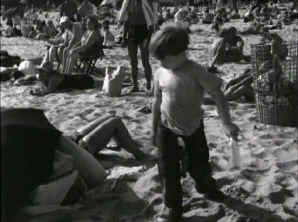 Engel used an innovative strap-on camera that allowed him to film unobserved by the thousands of sunbathers who appear in his film. Over the past fifty years, the couple's first film has drawn its share of praise. "Our New Wave would never have come into being if it hadn't been for the young American Morris Engel, who showed us the way to independent production with his fine movie The Little Fugitive," Francois Truffaut said in an interview in The New Yorker. Nobel Prize-winning novelist Saul Bellow wrote that the film's visual style had the ability to "penetrate the hard surfaces of appearances, make the stones eloquent, cause subways and pavements to cry out to us, the millions of dead in clumsily marked rows to influence us." Apart from its importance as a seminal film in the history of cinema, The Little Fugitive also does a wonderful job of catching the Coney Island of the 1950s, including the rides, the beach, the boardwalk, the hot dog stands, and, of course, the people of Brooklyn. Professor Foster Hirsch, from the Department of Film at Brooklyn College, will chat with the filmmaker after the screening. "Foster Hirsch is an old friend of mine," Engel says. "He once told me that The Little Fugitive was the greatest movie he's ever seen, and I'm not going to argue with him. As for myself, let's just say that the older I get, the better it gets." The screening of the seventy-five-minute film will take place on October 9, from 6:30 to 8:30 p.m. in the comfortable, acoustically sophisticated Woody Tanger Auditorium on the first floor of the Brooklyn College Library. The films shown in the "Brooklyn in Film" series will be chosen for their portrayal of people and places in Brooklyn that have captivated audiences over and over again. For more information about the series, please contact Judith Wild, (718) 951-5426, jwild@brooklyn.cuny.edu.